Every year during the last week in October, PhotoPlus International Conference and Expo http://www.photoplusexpo.com/comes to the Javits Convention Center in New York City (this year from 10/24-10/27). Photography seminars presented by many of the most knowledgeable people in the industry, presentations and appearances by some of the best-known photographers in the world and a huge exhibition floor displaying everything photographic. All the major names in camera equipment, printers, accessories, and photographic paper have booths set up for the 25,000 annual visitors that walk by. A few years ago, while walking through the exhibition floor, I admired the outstanding prints exhibited by the major printer and paper companies such as Epson, Canon, and others, which were all created by well-respected photographers to showcase the quality of the respective products. As with many Galleries that I have visited, I promised myself I would do everything possible to see my images exhibited at PhotoPlus Expo in the near future. I have been printing most of my portfolio and gallery prints on Hahnemuhle Fine Art Pearl, which has complimented my work and helped me impress the curators, collectors and gallerists that have juried my prints into shows. 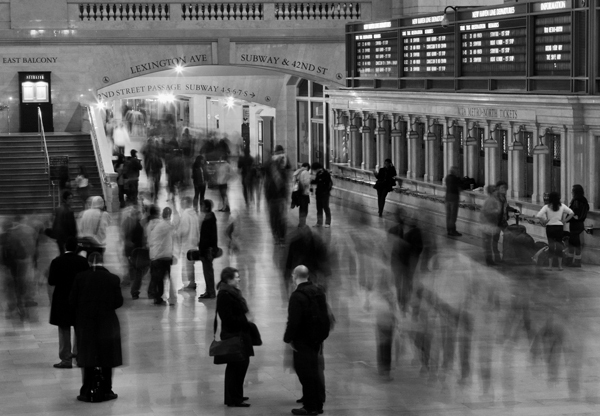 This year, I am honored that the 400 year old German Fine Art paper maker, Hahnemuhle www.hahnemuehle.com, has chosen one of my Cityscapes, Rush Hour, Grand Central Station, NYC to exhibit in their booth at PhotoPlus Expo to showcase their fine product… You know what they say…you’ve gotta believe.